Use water wisely by getting the water directly to the plants, where they need it. Watering cans are perfect for this as you can get to the roots of the plant and a rose attachment will prevent damaging the flowers. An added bonus is that watering cans can be easily filled with grey water. There are alternatives to using municipal water, such as borehole, well points or grey water as mentioned above. Mild or gentle soap is safe to use as grey water, kitchen water is not necessarily suggested due to the fats and oils found in the water. We stock an amazing product called the Water Warrior that assists in getting grey water from your home to the garden. Visit any of our garden centres, and our staff are more than happy to assist with installation information. 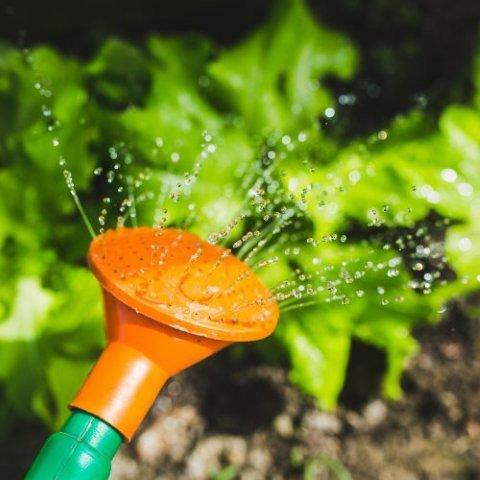 Once your plants have been watered you need to retain the moisture for as long as possible by mulching and composting. Mulch retains soil moisture and prevents soil erosion plus it suppresses weed germination and growth. Work plenty of compost into your garden beds as this too holds moisture in the soil and provides nutrients for plant growth. Step Three: Garden to ensure survival of your plants. Group or mass the same succulent for the best effect. This is a simple tool for the low maintenance gardener who wants the greatest impact with the least amount of work. Clever gardeners combine contrasting succulents to add extra interest to their gardens. Spiky, toothed, spongy, and rounded shapes or foliage of gold, copper, silver, bronze, red, green etc can be very appealing. Water less frequently, but more deeply. This will encourage your plants to develop deeper root systems, which are more drought resistant (the temperature can be up to 5°C cooler just 10cm below the soil). Avoid watering on windy days, as wind accelerates evaporation. It’s also best to water before 9am in the morning or after 5pm in the evening, rather than during the heat of the day.